This house has four bedrooms. 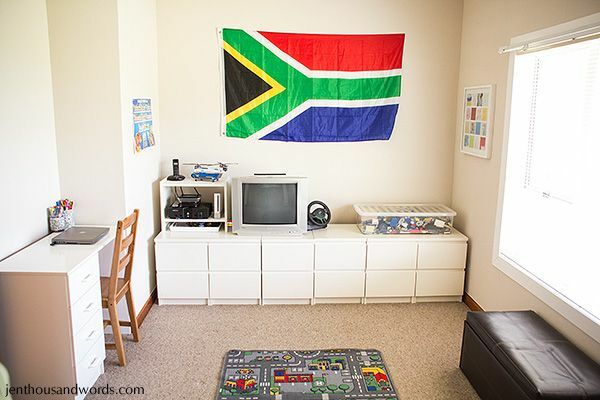 Daniel and Noah have chosen to share a bedroom to sleep in and have a playroom, rather than each have a bedroom. 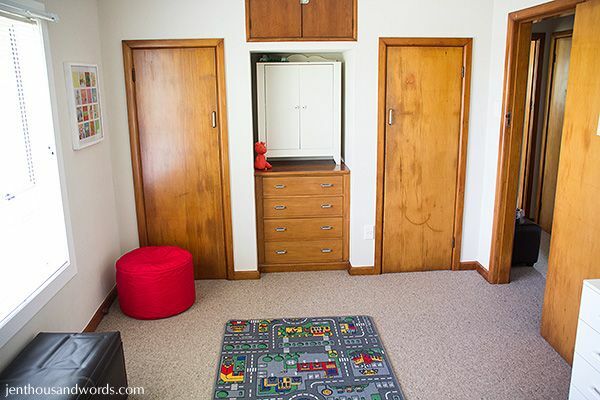 The house has a very weird layout which I'll have to show in a video sometime. Three of the bedrooms are at the back of the house and the one that is meant to be the master bedroom is at the front. 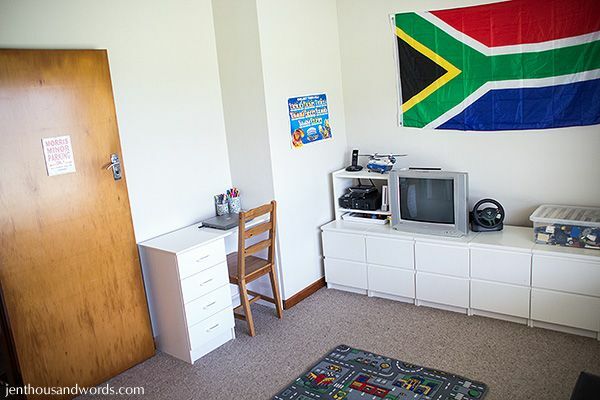 It's not really bigger than the other bedrooms (except for the boys' room which is small) - the only thing that indicates its status as master bedroom is the built in storage - a chest of drawers and two closets, plus some space above. 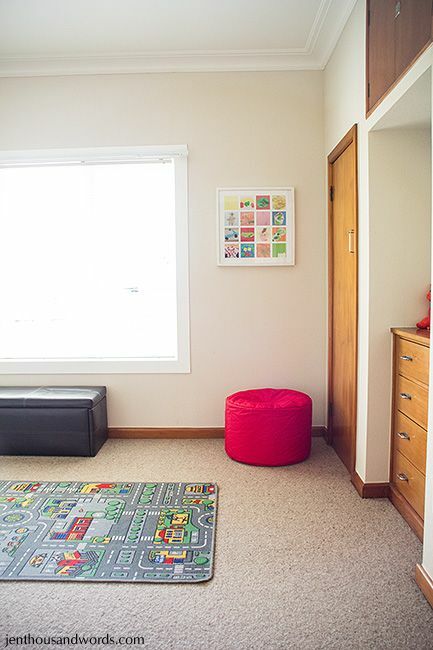 We chose this room for the playroom because it is between the living areas. Also, its position right at the front of the house, our house being straight ahead at the end of a cul-de-sac with an offshoot road, means that every passing car's headlights would shine into the windows at night. We got the TV off Freecycle. It is only for Wii and Xbox, it doesn't receive signal.The plastic container holds Lego. I put the Morris Minor Parking sign on the door :) I want to add a clock above the desk. The closets hold Grant and (mainly) my clothes as the closet in our room is not big enough, and Grant's stock for his business. The drawers hold toys, the Ikea cabinet (which fits perfectly on top of the drawers) holds books, with Lego baseplates on top / slid in next to it when not in use. The top storage holds our suitcases, tents and camp beds. 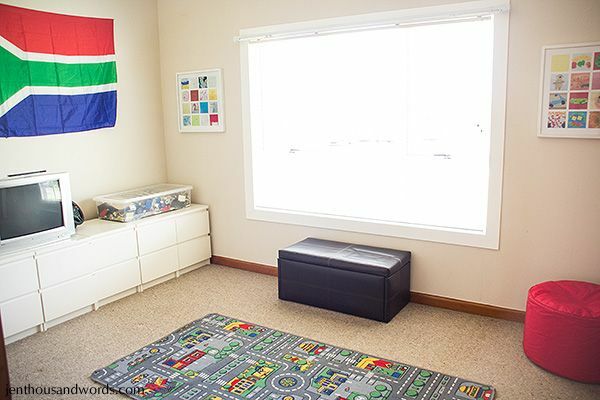 We love having the toys all contained in one room and the boys love having their own space to spread out and play!